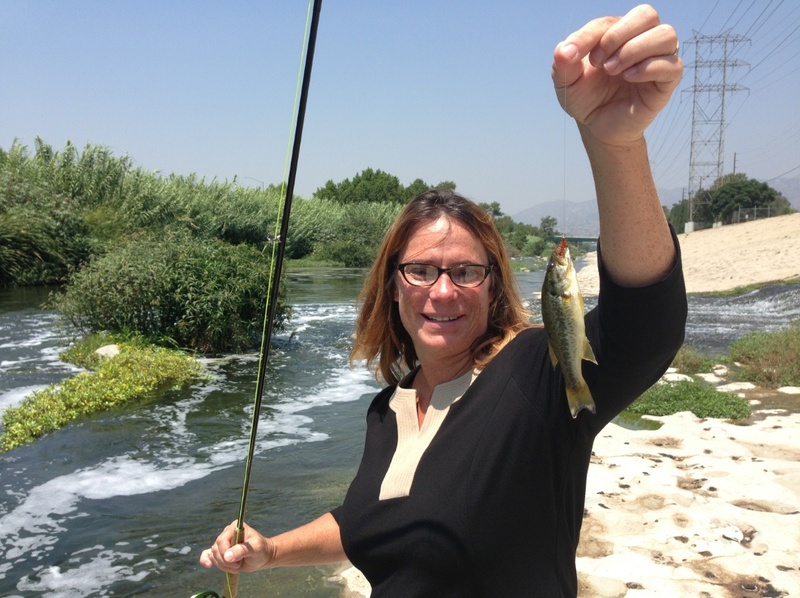 Whoa, yeah, L.A. River yields second bass! I brought my friends, Bob and Michelle, to the L.A. River for a casting lesson one day before they left on a trip to Montana and the Madison River. They were blown away by the river, as most are when the visit it for the first time. I wasn’t expecting to catch any fish, as the moss was high and water, low. When Michelle got the hang of casting and mending, I was showing her how to work a pool by taking a few steps upstream and — wham — a beautiful little bass smacked the crayfish pattern I had tied on. So, her first fish on a fly rod was on the L.A. River. “I can see how this could be addicting” was her comment between smiles. Crayfish are non-native and extremely invasive! Why is anyone allowed to use them as bait in local waterways??!! She actually used a crayfish pattern, not an actual crayfish. Much of the aquatic life in the river isn’t native, including carp, tilapia and sunfish. We’ll have to see how this all plays out with the river’s renewal. Steelhead, which are native, were largely wiped out once the river became a concrete-filled flood zone, eliminating their ability to return to the mountains to spawn. Where there are babies….. there are LUNKERS! Perhaps dudes who dropped bass into new Echo Park Lake have also stopped at the river to do their deed. Who knows, but maybe that’s what’s happening. The FOLAR fish survey from a few years back found only one bass. Saturday: Sunfish, small carp, tilapia, one medium carp 2-3 ilbs and a…..1 lb largemouth bass. I’m still smiling. Very nice day! If you’ve got a shot of a tilapia caught on the L.A. river, can you send it to me with your name and a short story? Thanks, tight lines. Some people complain that the LA river is full of non-native species. There is not one place in the United States that has only native species. Some life is better than no life. Let’s remember that nearly all of us could be considered non-native. I share your feelings but there are some (rare) places where only native species presently exist, and can be caught by anglers (and released, please), and I’ve fished one in Rocky Mtn. Na. Park. Roaring River, a high mtn. stream you hike to, and there the state poisoned out the interlopers and restocked the rare-almost-extinct-pure Greenback Cutthroat trout. There are others around, but it’s comparatively rare.